I’ve often said that I miss the comics covers of old. Those covers were designed, unlike many of the ones being produced today which are merely mini-posters spotlighting the titular character without giving any indication of the story contained inside, to draw readers in and make them anxious about actually reading the stories contained therein. Of course, this was also a time when comic books could be found all over the place, from newsstands to the local drug store, as opposed to only in specialty comic-book shops, and they were largely focused on catching the eye of someone just passing by the comics rack instead of depending pretty solely on regular readers who are willing to go every Wednesday to get their weekly fix, but that’s a discussion for another time, I suppose. Anyway, “Covering Comics” is going to be a probably irregular series of posts where I take a look at various covers from the past, highlighting some of my personal favorites, or other covers of note for one reason or another. 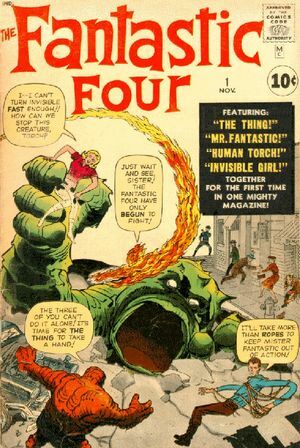 Last time in this column we took a look at some classic Fantastic Four covers from issues 1-100. (BTW, I am talking about the original series which started in 1961 here, not any of the later reboots, restarts, renumberings, what-have-you that have been published since. This time I thought we’d just take a quick glimpse at a few more covers from issues 101-200. Let’s start with issue 103. 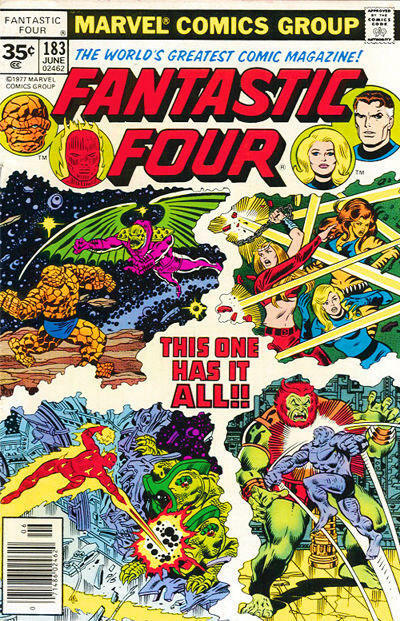 There are a lot of things to like about this cover, but what makes it stand out for me is that not only do you have the Human Torch arcing into the picture in a pose that is iconic for the character, but you have Reed’s arm paralleling that arc so that the two figures encircle the action and help to focus the viewer’s eye on the main event, the fight between the Thing and Namor. Issue #106 spotlights one of the recurring themes of the series by using a kind of split-screen format: separately each of the team members is very vulnerable to attack. It’s only when they come together and fight as one that they are truly at their best. With issue #07 we get another of the series main themes, that of self=sacrifice. No matter how much Ben Grimm may wish to regain his human form, he is willing to forsake that and become the Thing again when doing so is the only way for him to rescue and save the rest of the team. 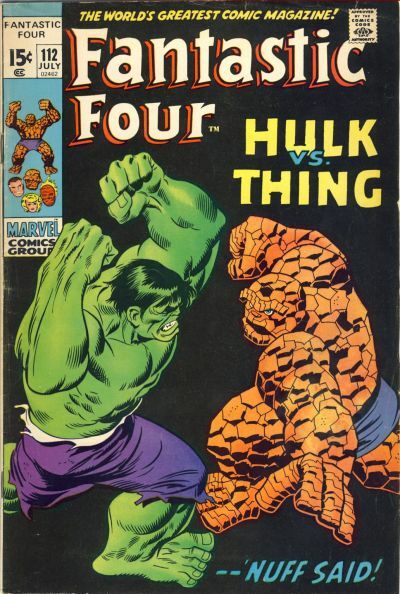 Last time around, I spotlighted issue #25 which gace us one of the earliest battles between the Thing and the Hulk. Of course, this was a fight which would call for many rematches over the years, and one of them is highlighted on this cover to issue #112. This cover to issue #116 is another one of those which was created to really draw in the more casual reader along with those who picked up the series regularly. 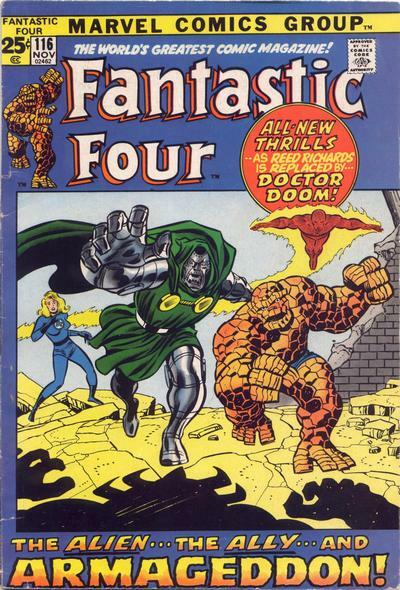 After all, who couldn’t help but wonder what could possibly get the team to follow Dr. Doom into battle, and what has happened that forced Reed Richards to the sidelines? 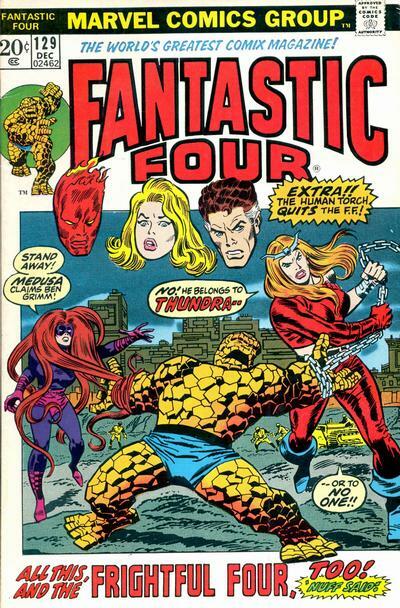 The floating heads of the Thing’s fellow team members on this cover to issue 129 was a theme that recurred quite a few times over the years, not only with the FF, but with many team books, once again visiting the idea of one member’s vulnerability when he is forced to fight alone as opposed to when the team is fighting as a cohesive unit. Issue #140 uses a technique that really wasn’t often seen on covers, that actually breaking the cover into separate panels, just as would be done with the interior pages. Also, it’s worth noting that this is actually the British version of the cover as designated by the 6p price in the top left corner. Ah, issue #150. Another “anniversary issue” means another wedding, this time between Crystal (a member of the Inhumans who was also a long-time girlfriend of the Torch) and the mutant Quicksilver. And look who’s there to interrupt the proceedings – none other than the Avenger’s frequent (and recent cinematic) foe Ultron! Issue #168 takes another look at what happens when Ben gets his greatest wish and regains his human form. 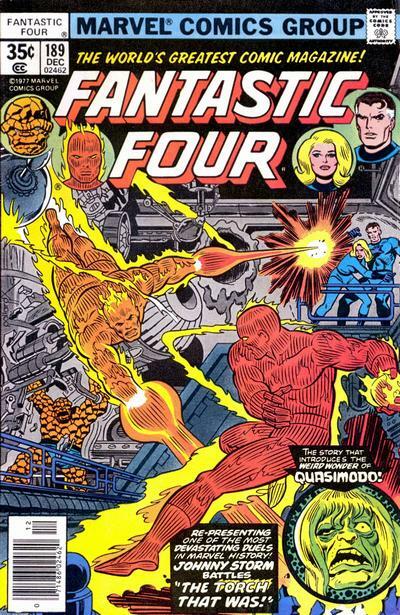 How can the FF still be the Fantastic Four when only three of them can race into battle? In this case the answer is to replace him with Luke Cage. 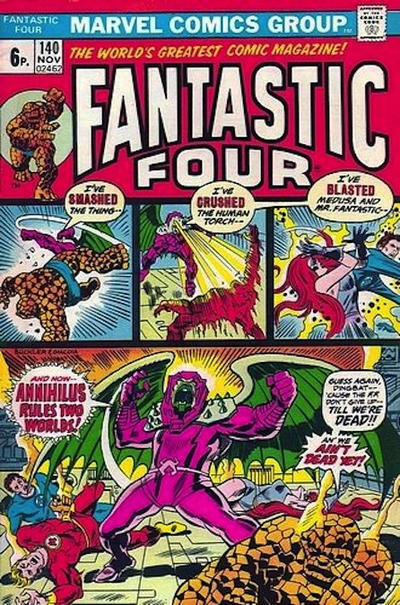 Of course then the question becomes one of whether, like the Avengers, the members of the FF are really that interchangeable or if there is some other, more special quality that makes this particular grouping of characters special. The cover to issue #183 again revisits the “split-screen” style, (one which works very well with this particular team since the splitting of the cover into four panels echoes the four of the title, but in this case it’s used not as much to suggest the separate vulnerability of the characters, but the sheer amount of action to be found inside the comic. Of course, there’s also the question of what’s going on in that fourth panel and who the purplish guy is that seems to be there instead of Reed. And finally we come to issue #200. I mentioned before that #150 was an “anniversary issue”, and obviously #200 was cause for even greater celebration. 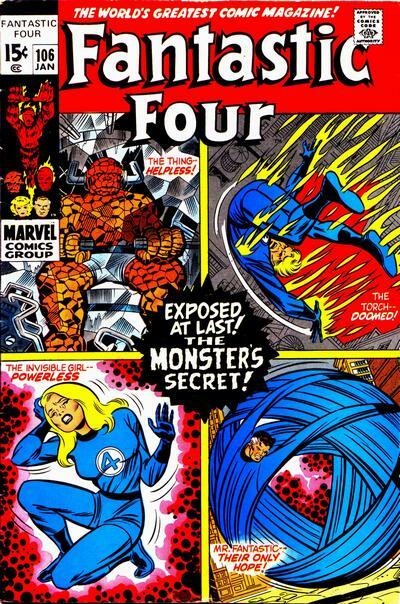 This particular issue saw the climax of a feud which had been going on since almost the very beginning of the FF, and a storyline which had been dominating the series for about six months: the “final” showdown between Mr. 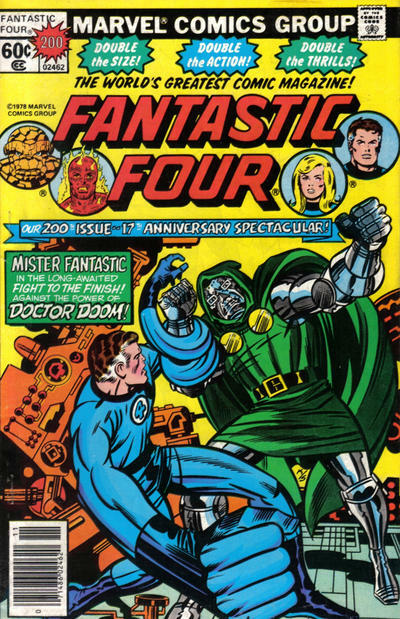 Fantastic and Dr. Doom! 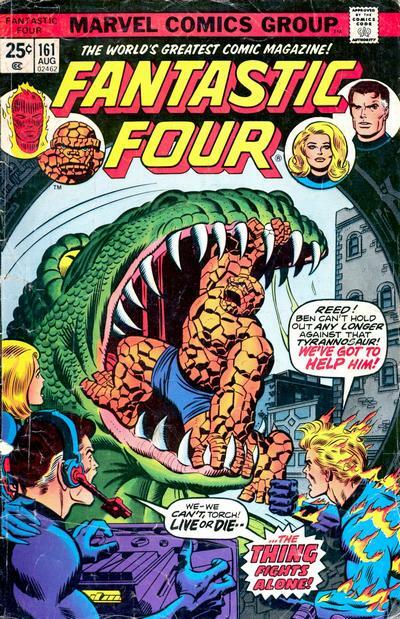 Okay, I think we’ll wrap up our look back at FF covers with that one. Obviously, there are a lot that I’ve skipped over, and there would be a lot more exciting covers to come, and maybe we’ll get to some of those in a future “Covering Comics” installment. Are there any of your favorites that you think I’ve overlooked or later ones that you’d like to see featured? 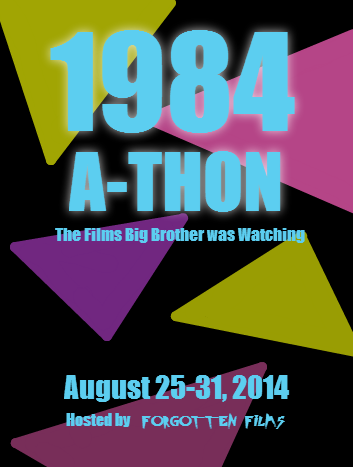 if so, be sure to let me know either in the comments below or over on the Durnmoose Movies Facebook page. 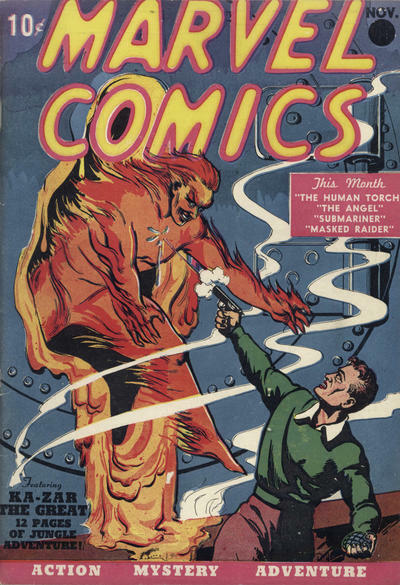 Oh, and just as an added bonus: I mentioned earlier the original Human Torch, so I thought I’d throw in this cover which not only spotlights him, but is actually the comic that started it all, 1939’s Marvel Comics #1. I know that I said I would be following up the last Classic Television Thursday post with more on the Amos and Andy TV show, and I will be in a couple of weeks, but I decided that could wait a little bit when, during a discussion with one of my younger co-workers of the new Mission: Impossible movie he mentioned that he didn’t know that there had been a Mission: Impossible TV show. Incredible as that seemed to me, I realized that of course there would be many of the younger generation that had no idea of the series as it existed before the film revival. 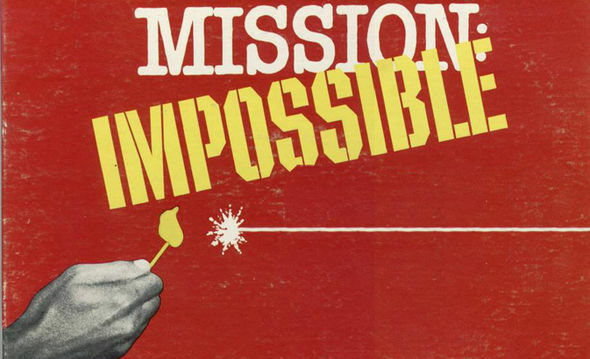 Anyway, Mission: Impossible debuted in the fall of 1966 on CBS. 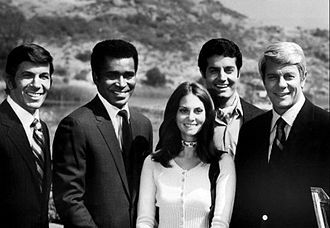 The basic premise was actually fairly atypical from the usual TV series, in that, at least in it’s initial conception, the only real recurring regular would be the team leader (Steven Hill playing Dan Briggs in the first season, then Jim Phelps, played by Peter Graves in later seasons) and the rest of the operatives would either be chosen from a rotating cast of characters or would be special guest stars who would be brought in for a particular episode so that there was no real set team. 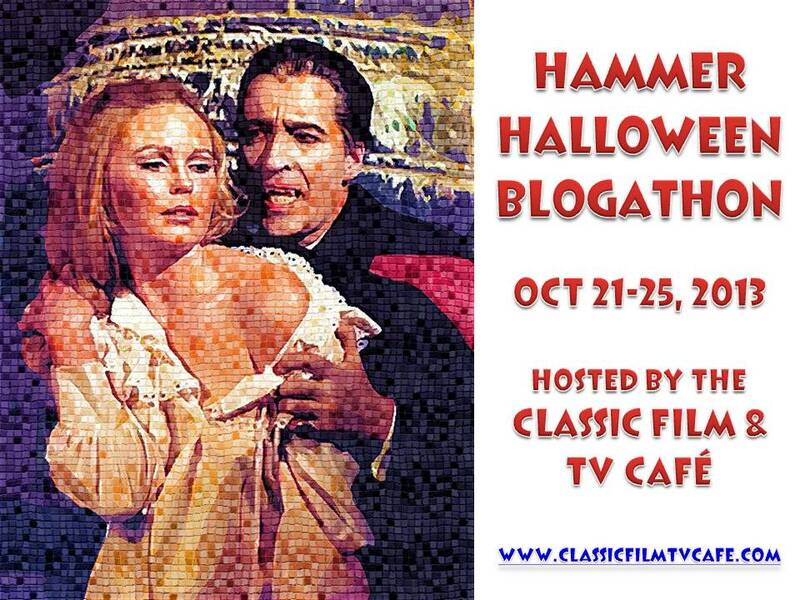 Of course, in practice, this was a bit harder to pull off, so there eventually evolved a regular cast which consisted of Greg Morris who played Barney Collier, the electronics genius, Cinnamon Cater (Barbara Bain) who was a fashion model and actress, Willy Armitage (played by Peter Lupus) who was the muscle of the team, and makeup artist and magician extraordinaire Rollin Hand, played by Martin Landau. Of course, as the seasons went on, these regulars would change (Leaonard Nimoy was even a regular cast member for a couple of seasons), but that was at least the initial core group. 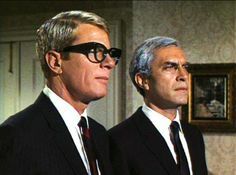 The show almost always followed a standardized format: After the initial title scene (btw, it’s interesting to note that while it always featured Lalo Schifrin’s unmistakable theme song this sequence was actually different from week to week as it would actually show short clips from the episode to follow as it traced the path of a lit fuse) which saw Briggs/Phelps receive a tape recording, phonograph record, phone call, etc. which would give the general outline for the plot of that week’s show. Most episodes begin with the leader of the IMF getting the assignment from a hidden tape recorder and an envelope of photos and information that explains the mission. The tape almost always begins with “Good morning/afternoon/evening, Mr. Briggs/Phelps.” Then it explains the situation and ends with “Your mission Dan/Jim, should you decide to accept it” or words to that effect, with a brief explanation of the mission. The listener is reminded, “As always, should you or any of your I.M. Force be caught or killed, the Secretary will disavow any knowledge of your actions.” At the end of the instructions, Phelps/Briggs is notified, “This tape will self-destruct in five [or, occasionally, “ten”] seconds. Good luck, Dan/Jim.” Then smoke would rise from the tape, and the instructions would be destroyed. 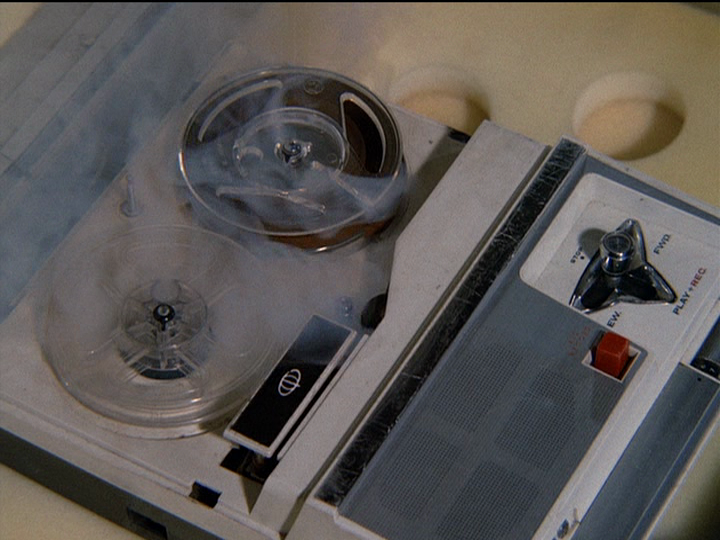 After that, at least initially, when the make-up of the team in each episode was more in flux, there would be a dossier sequence which would show Dan or Jim shuffling through a selection of photographs and biographies of available team members, sorting them into yes or no piles depending upon the skills necessary for the upcoming job. This scene not only allowed new viewers to quickly pick up on just who was who, but was the chance to introduce any guest stars that might be appearing in that episode. This would be followed by a briefing scene during which the plan, and each member of the team’s part in it would be outlined. Of course, it also provided the viewer with certain expectations for what was to follow which would add to the tension when either the plan would have to be changed mid-stream, or something would occur which would make it seem that the plan, as outlined, had been disrupted beyond repair. Finally, after all of this set-up, the plan would be put into motion and the adventure would truly begin. Unfortunately, I have to confess that I don’t think I’ve seen any but the first of the recent M:I films all the way through, so I can’t comment on how well or whether they follow this format. On the other hand, the release of the latest in the series, Rogue Nation, has brought along with it the perfect chance for those of you who are curious to check out this high quality television series: Target is currently carrying season box sets for less than $10 apiece, and if you;re a fan of the movies, or just of spy or caper/heist shows in general, I highly recommend giving them a try. 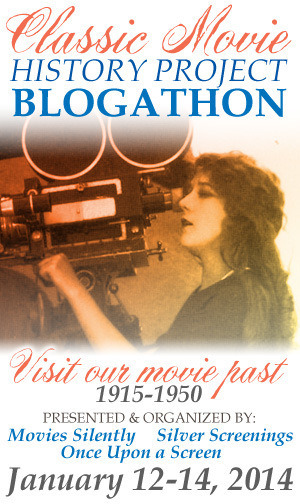 Next time we’ll take a look at the other television to movie adaptation that’s currently in theaters. The Final Girls appears to be this year’s entry into the The Cabin in the Woods wannabe sweepstakes, and from the looks of the trailer at least, it could have a pretty good shot at at least being quite entertaining, though I doubt it;s going to be the game-changer that CitW turned out to be. This first trailer definitely looks promising, but I think this is also probably the last one I will watch before the flick makes its Halloween debut, because I don;t want to have all the best gags/what more plot there might be spoiled for me before I enter the theater. which is always the risk one runs with movies like this. Anyway, we’ve got some time before the movie does hit theaters, and while this one does seem to give a pretty good feel for the tone and basic plot, I don’t think it’s too spoilery (though if you want to go in completely fresh, you might even want to skip it) so I say go ahead and check it out. I really don’t want to get into all the “he said/they said” about who’s to blame for the new Fantastic Four movie, as I suspect there’s plenty of blame to go all around. Instead I’ll start things off this way: I really can’t consider it a good sign when I find myself actually dozing off during what should have been an exciting new take on one of Marvel comic’s most prestigious properties. Instead of that, however, what we got was at best a rather bland movie that tries to up the ante and bring in some actual conflict at the very end, but by then it’s far too late. Those of you who have been following this blog for a while will know that I’ve really considered this movie to be a mistake ever since it was announced that Josh Trank would be directing it. I have absolutely no problem with his first film, Chronicle, but from the start I felt that his style – that of a more earthbound, serious, and “let’s throw every speck of CGI dust and dirt that we can on the screen” style simply was the wrong fit for a movie that should be evoking a sense of wonder and sparking the imagination of the audience. 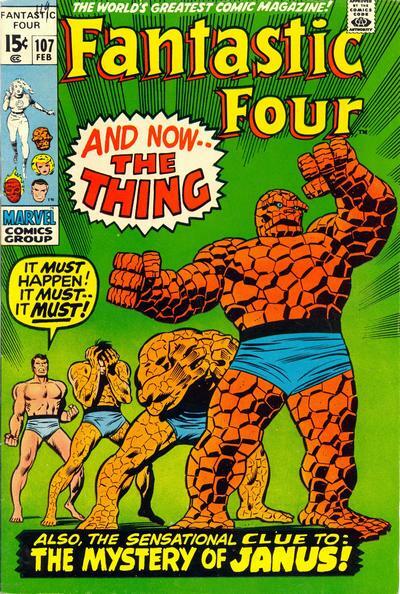 After all, the original Fantastic Four comic was the flagship of what we now know as the Marvel Universe. It was the foundation of everything that came after, from Spider-Man to the Avengers to the X-Men to… well, I could go on and on, but you all know exactly what I’m talking about. Unfortunately, the only thing this movie is going to inspire is a lot of yawns. Then there came the casting announcements. 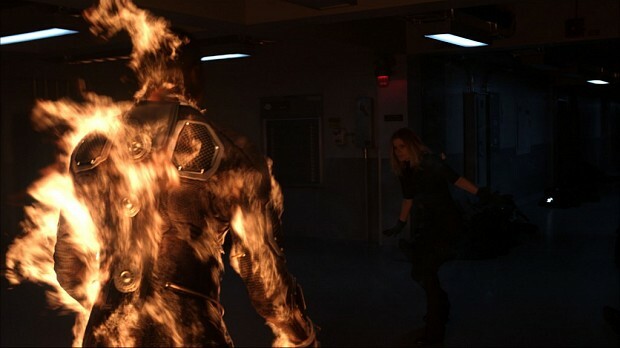 Of course, most of the focus at the time was on the casting of Michael B. Jordan as the Human Torch. As it turns out he may actually be the most appropriately cast character in the entire movie. Don’t get me wrong, I love Miles Teller, and was appropriately impressed with his starring role in last year’s Whiplash, but he’s simply not the right choice for the role of super-professor Reed Richards. As for Kate Mara’s Susan Storm and Jamie Bell’s Ben Grimm, let’s simply leave it at “the less said, the better”. 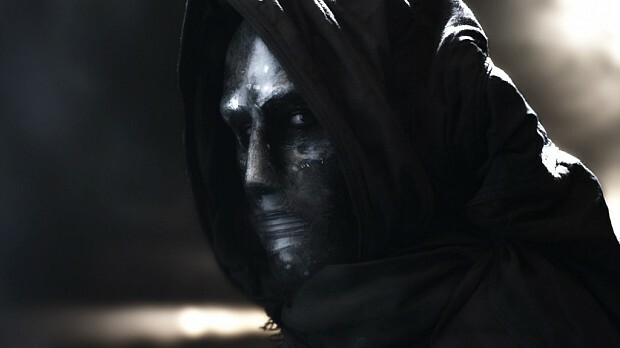 I will, however, allow that Toby Kebbell, who is given the rather thankless task of taking on the role of the main villain of the piece, Victor von Doom (hey, why should I call him Doctor Doom when the only reference to him as that comes from a snide aside by Sue Storm before they even begin the fateful trip that gives them their powers?) does the best he can with the material that he has to work with. Okay, so I suppose this is the point in this write-up where I should get down to the nitty-gritty and begin pointing out all of the things that are wrong with this movie, but if I really tried to do that, then I would be sitting here all day writing this, and it would actually be giving the movie more time than it’s actually worth. (Which, I admit, I may very well have done already.) 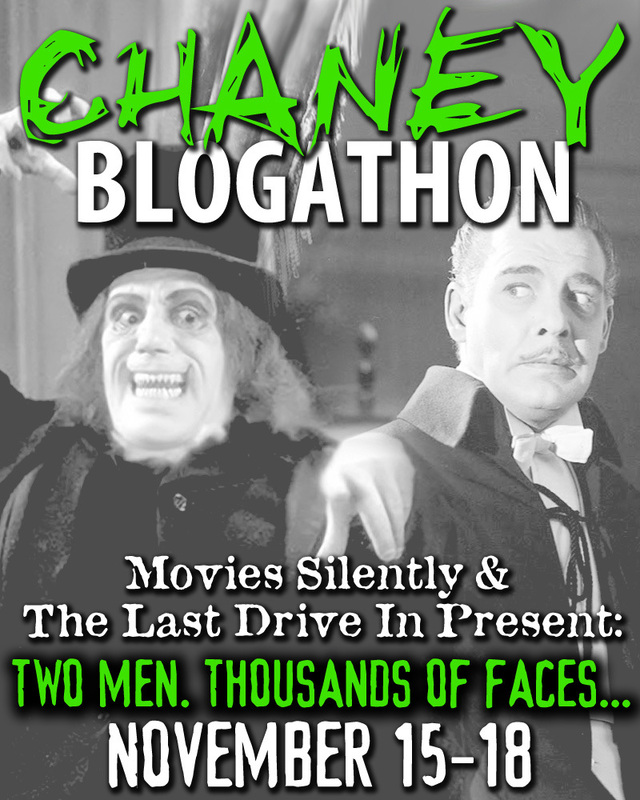 Plus, there are plenty of other writers out there who are perfectly willing to do that, and personally I’m just salivating over the thought of watching the Cinema Sins guys dig their teeth into this one. Instead, I’ll simply state that from the script level up, this movie so completely misunderstands not only these characters, their motivations, and what actually binds them together as a team that one begins to suspect that Trank (who was also at least partially responsible (I almost wrote “to blame”) for the script has never read any of the comics on which the film is supposedly based, but was simply given an outline of the characters and their powers and was told by Fox to go make a movie. And the thing is, I’ve come to accept that I’m not necessarily going to see the comic books that I grew up with brought to life when I sit down to watch one of these movies. After all, it’s a different time, there are different audience demands, and I’m willing to accept that, as long as you don’t violate the core concepts of the characters and what makes them unique. Want to change the origin? Well, okay, I may not like it, but I’m willing to accept it, especially since Marvel already set the precedent of making the voyage they are taking about going into another dimension as opposed to outer space in their Ultimate line of comics. On the other hand, I really don’t need that revamped origin to take up 4/5ths of the movie. 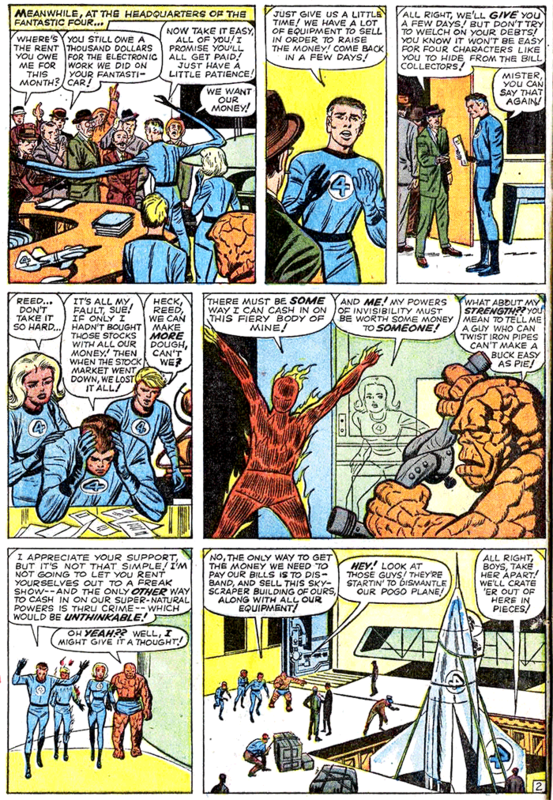 Heck, Stan Lee and Jack Kirby only needed eight or so pages of the first issue to get the ball rolling, and they were introducing not just a new team to the comics world, but an entirely new style of story telling. (Well, okay, maybe there’s a bit of hyperbole in that sentence, but you get the idea.) As far as the argument that the movie is using that time not just to show the origin but to establish the characters, I’d argue back that a) there’s not that much to these characters that needs to be established, and b) that’s the kind of thing that can be done just a well as the story moves along and you actually give us something worthy of the word “fantastic” to watch as opposed to simply more talking heads. Oh, and as far as that sense of the fantastic goes? I’ll actually pass comment on that to my daughter who stated that she’d actually seen better special effects in some Disney Channel movies than what was on display here – a statement I find it hard to disagree with. Of course, the movie really isn’t a total loss. At least when it comes out on disk I’ll know that if I ever have insomnia I can simply pop this one in and I’ll be sleeping like a babe in no time. So I guess I should at least thank Fox for that. 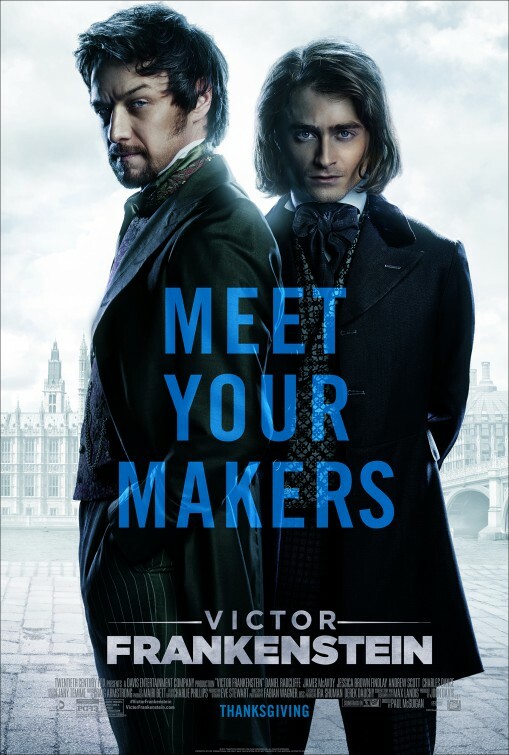 Considering Fox’s growing reputation for really farking up properties like this, while I’d like to believe that they’re going to give us a good interpretation of this with their Thanksgiving release of Victor Frankenstein, I’m finding it harder and harder to buy into. 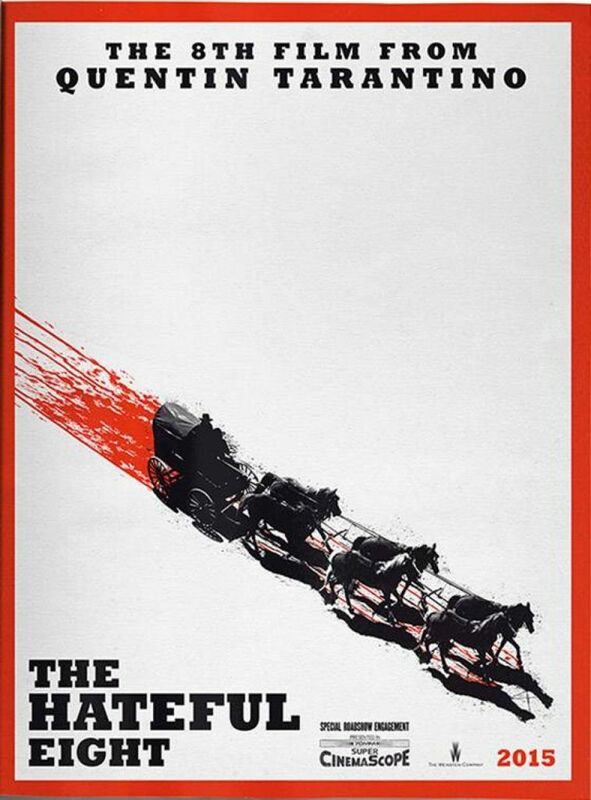 When an early version of the script leaked online, Quentin Tarantino almost decided to cancel his plans to make The Hateful Eight. I think we can all agree from looking at this trailer that that would have been a bad decision. Personally, I don’t think Christmas can get here soon enough. Yeah, I think a ticket to see that will look pretty nice under the tree. So despite the critical drubbing and the box office failure of their new Fantastic Four movie, Fox says they remain “committed to these characters”. Fine. While I would prefer to see them let the rights revert back to Marvel so that we could see what their home studio could do with them and we could see them integrated into the larger cinematic Marvel Universe, it occurred to me in a recent discussion of the film with some of my co-workers that there is one way that the studio could actually take advantage of the situation it currently finds itself in in regards to the movie, and could actually use that as the perfect set up for a sequel. And the idea even comes directly from the first year of the actual Marvel comic book. Fantastic Four #9 to be precise. 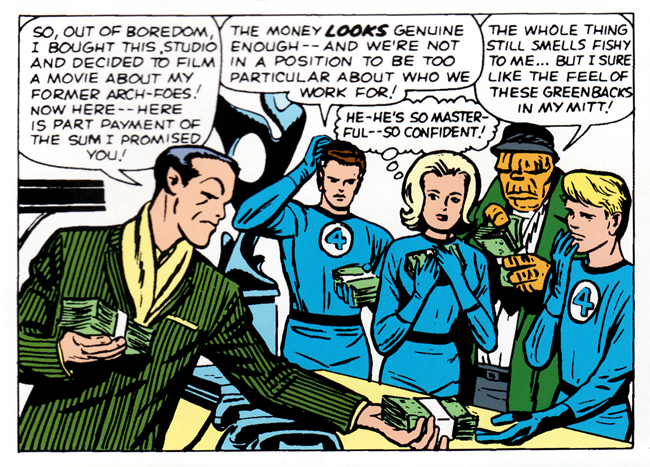 The issue opens with Reed Richards telling the team that it appears they are bankrupt. Despite the fact that he has sold many of his freshly created scientific devices, he has also made some bad investments, and the team now finds themselves penniless. 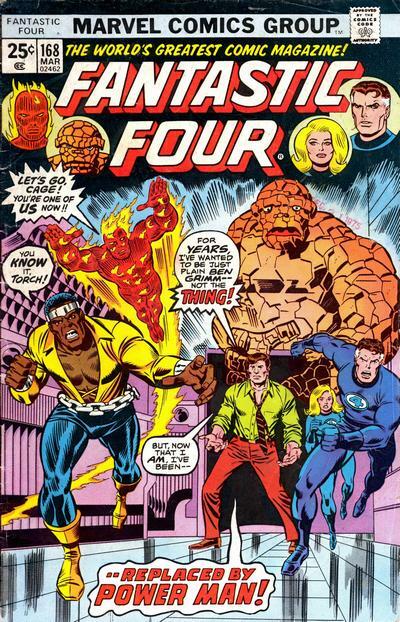 Fortunately, it just so happens that at the same time an offer appears for the Four to appear in a Hollywood movie based on their many exploits. 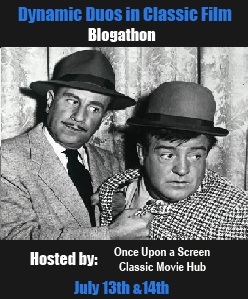 Deciding that their only option seems to be to take the offer, the foursome hitch-hikes (yes, I said hitch-hikes) across the country from New York to Hollywood to take the studio up on their offer. Upon arriving, however, the team makes a shocking discovery. 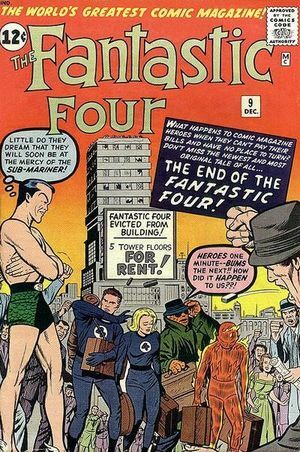 It turns out that the studio that has made the offer is owned by none other than their long-term nemesis, Namor, the Sub-Mariner. 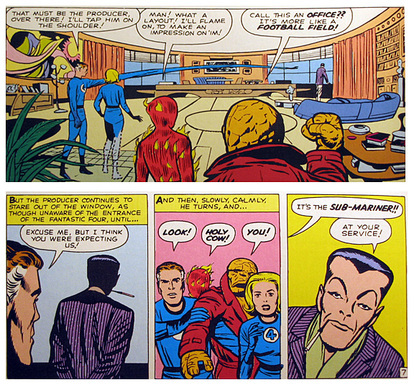 According to the story he tells them, Namor has used the vast wealth he has gained from looting surface vessels that have fallen to the bottom of the sea to buy the studio, and despite their antagonism he realizes that there is money to be made from a film about the team’s many exploits. Though they are, of course, distrustful of their foe’s motivations, the four agree that they really have no other option than to go along with the scheme, especially when the Sub-Mariner gives them a partial payment up front. Anyway, in order to begin filming, Namor orders Reed, Ben, and Johnny be taken to varying locations where they can show off their super-powers. Meanwhile, he will stay behind at the studio with Sue. Of course, it all turns out to be a trap. 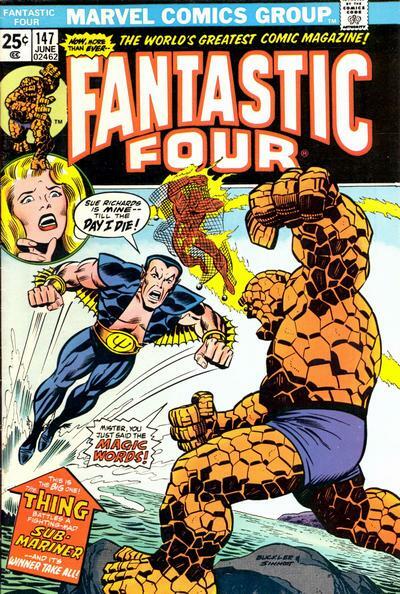 You see, ever since they first met in FF#4 (yes, their rivalry with the Sub-Mariner actually pre-dates their first meeting with Dr. Doom, at least as far as the comics go), Namor has had the hots for Susan. Therefore he has concocted this scheme not only as a way to destroy the male members of the four, but to woo the Invisible Girl over to his side in order to make her his bride. Of course, his scheme eventually fails, with the Thing, the Torch, and Mr. 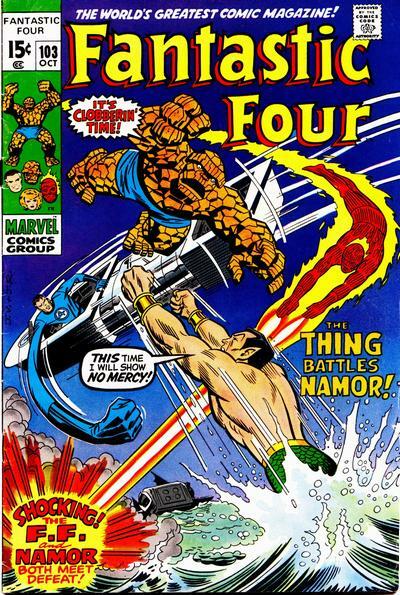 Fantastic escaping the traps Namor has set for them and Sue completely rejecting his advances. Finally, confronted with the reality that his scheme has fallen apart, Namor not only gives up, but gives them the rest of the payment that he has promised them in exchange for appearing in his movie. So how could Fox take advantage of this story to create a sequel to the current Fantastic Disaster without completely nullifying it? It’s simple, really. 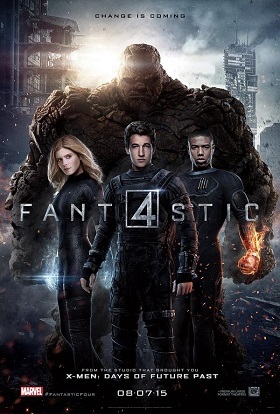 They revert the characters back to something closer to their original incarnations, change the motivation of the Sub-Mariner (or whatever villain they want to use and/or have access to) from trying to woo Sue to wanting to humiliate the Fantastic Foursome by making a really bad movie about them, and voila, instant sequel plot. I mean, really, it makes as much sense as heading on down the same path that viewers have already rejected. Plus, it would allow the studio a chance to win back some of the fans of the actual comic book – you know, those of us who were clamoring for an actual FF movie to start with and who made the property valuable to the studio in the first place. Plus, there’s more action in this 22 page story – thanks to the talents of Stan and Jack – than in most of the superhero movies to date. C’mon Fox. I mean really, can this idea really be any worse than whatever else you might come up with for a follow-up?